Our franchise venture aims to fortify and preserve the primary objective of the government of Dubai in establishing a regimented taxi service in the Emirate and cater the growing demands of residents, tourists and visitors of Dubai. We offer taxi services committed to delivering the best transportation solutions to commuters in Dubai, with enhanced customer satisfaction and safety. 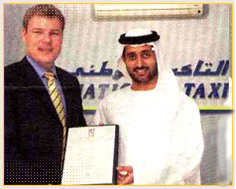 On 20 May 2002 National Taxi was awarded by Dubai Transport Corporation as an outstanding Taxi Franchisee company. On May 31, 2003 National Taxi became the only taxi franchisee company which was awarded a certificate of Excellence ISO 9001:2000 from DNV Veritas. This achievement demonstrates our competence and proof that we have met the international consensus on good management practices.